DESPITE a strong start and finish, Dumbarton let vital points against Raith Rovers slip from their grasp on a sunny later afternoon, going down 3-2 at the Cheaper Insurance Direct Stadium. A crowd of 655 saw the game start evenly, with few chances at either end. But gradually Sons began to look more in control, pressing forward with style. On 12 minutes a great ball from Tom Walsh found Christian Nade (pictured). He trapped it, turned, and fired home from close range to put the home side into the lead. 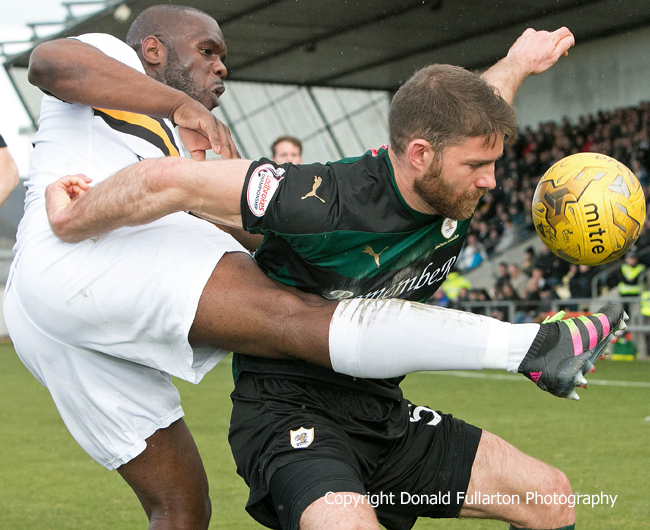 What followed was a good, confident first half performance from Dumbarton, but no further scoring before the break. It was a different story in the second half. Raith started determinedly, and within minutes were back on level terms. A defensive lapse let Ryan Hardie in to beat keeper Jamie Ewings, then Aidan Connolly put the visitors into the lead on the hour, thanks to a great strike from 20 yards out. On 70 minutes James Craigen found himself with time on the edge of the area to curl the ball past Ewings to make it 3-1 for Rovers. Young Donald McCallum came on for Dumbarton with just under 15 minutes left, as the men from the Rock attempted to turn the game around. Nade had to go offer with a nasty leg injury. Stevie Saunders scored a second for Sons deep into time added on, but it was too late for an equaliser. The defeat in front of BBC Alba cameras left Sons still five points clear of Livingston with three matches left in the struggle to retain a place in the Championship.